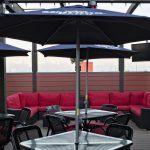 Visions Electronics installed every Canadian Brewhouse location with up to six outdoor-rated 46-inch SunBriteTVs per patio to bring the bar’s award-winning interior viewing experience outdoors. How does a sports bar become and award-winning sports bar? Great food, great drinks, a great atmosphere and great viewing experiences. The Canadian Brewhouse is well aware of this recipe for success. The sports bar has won the Consumer Choice Award for Best Sports Bar and Best Pub for the last five consecutive years and counting. Contributing to The Canadian Brewhouse’s success is its display technology. 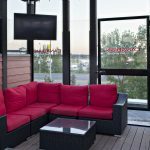 The Canadian Brewhouse’s interiors boast up to 50 or more screens playing every sport imaginable, but recently, the owners decided they wanted guests to have an opportunity to watch their favorite sporting events from the outdoor patio as well. It was important, however, that guests would feel the same award-winning atmosphere outside that they felt inside. With the help of Max Bakridi at Visions Electronics, Hillman AV and multiple other Canadian installers, the Canadian Brewhouse is now equipping each location with up to six outdoor-rated 46-inch SunBriteTVs per patio across the British Columbia, Alberta, Saskatchewan and Manitoba chains. All SunBriteTV displays withstand heat, rain, snow, salt corrosion, sand and insects and the SunBriteTV Signature and Pro Series displays have a guaranteed performance range of -24 to 122 degrees Fahrenheit — making the displays a perfect solution for Canada’s freezing and unpredictable winters and hot and humid summers. Post installation, the Canadian Brewhouse recently upgraded to all 4K UHD displays to enhance viewing experiences even more.